Warren first introduced its own branded vehicles back in April 2016, having experienced a fragmentation of national hauliers and with the company requiring a solution that met the needs of its customer base. Needing to react quicker to customer demand, it acquired its first set of vehicles. Fast forward two and a half years and, with Warren having gained a much broader customer base together with increased demand for its products, there came the need for a much greater capacity to be added. 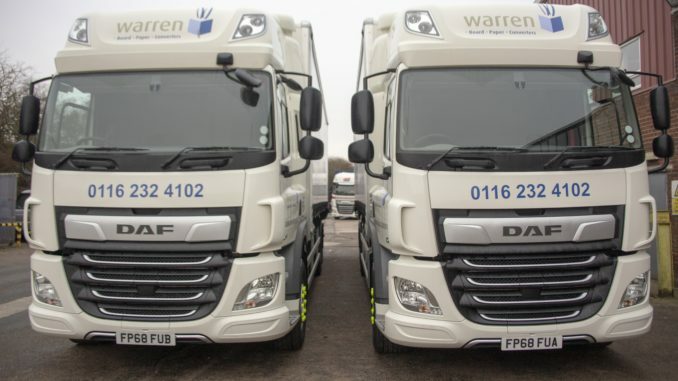 Therefore, at the beginning of 2019, Warren acquired two 26T DAF CF curtain-sided vehicles from local truck supplier Alltruck plc. As an ISO14001 certified company, Warren takes its environmental concerns seriously, so both vehicles are Euro6 compliant.